Nocton Dairy withdraws its application for 4000 cows on Nocton Heath. This has to be good news for the many, many people who campaigned against this proposal for the first superdairy in the UK. 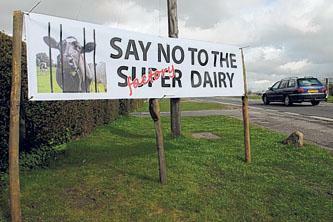 People campaigned for different reasons – some concerned about the impact on their lives; some concerned about the welfare of the cows; some concerned about the impact on the environment and the local water supply; some concerned about the impact on the future viability of the British dairy sector – all had a valid reason to come together in a common cause against the superdairy and its representation of the unacceptable industrialisation of our livestock sector. And through the intense media interest in the superdairy a spotlight has been shone on the dairy sector as never before. Many have come to recognise that the superdairy will never be a solution to the problems of the dairy sector and will always be a symptom on the problems. Most of the campaign organisations now recognise that the primary driver forcing farmers to consider the superdairy model is low farmgate prices. Today the farmer receives around 26 pence per litre (ppl) for producing the milk whilst the supermarket takes 22ppl for just stocking milk on the shelves. To put that in historical context over the past 10 years farmers have seen their share increase by 30% whilst the retailers share has increased by 300%. That cannot be right. And its not just the farmer being abused – the consumer is being ripped off too. This injustice in the milk chain has to be addressed. And now is a great opportunity to refocus the campaign against the superdairy onto the injustice in the milk chain that is the primary driver behind the advent of the superdairy concept. We need to bring together consumers, NGOs and farmers in an alliance to fight for a just and equitable milk chain that delivers a decent return on time and investment for the farmer; delivers safe wholesome milk to the consumer; and delivers all the social and environmental benefits we all want to see in the countryside.